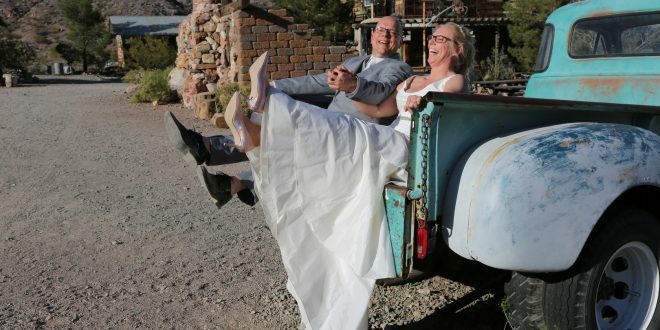 Iris and Henk traveled all the way from the Netherlands to experience Las Vegas and get themselves hitched! 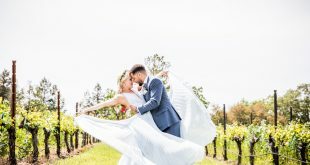 This fun-loving couple had been together for eight years and decided it was time to make it official, but they wanted to do it on their terms. Iris is a photographer back home, so she was instantly drawn to the vintage appeal of Nelson Ghost Town, aka Eldorado Canyon in the Nevada desert, about 45 minutes from Vegas. They hired the creative folks from Custom Las Vegas Weddings to plan their big event and chose the town’s Cholla barn for the ceremony site. After that though, they explored all of the cool vintage artifacts in town and had an amazing time taking photos and making memories to share with their friends back home, all the while looking fabulous. 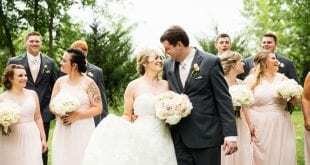 Iris was picture perfect in her trumpet cut gown with its multi-tiered skirting and Henk was handsome in his three-piece gray suit with white silk tie. Congratulations Iris and Henk, looks like you had a blast!